I like to bake. I try not to do it to often because I REALLY like to eat what I bake. Luckily, we bring baked goods to work for co-worker’s birthdays so I can bake and share fairly often. That means that I go through a lot of vanilla extract. Recently, I came across an article in an old print version of Craftzine (this link doesn’t work on mobile devices) that tells you how to make your own vanilla! Of course I had to try it. Supposedly you make so much that you can even give batches away as gifts. The instructions in the magazine are pretty detailed so I won’t rewrite them all. 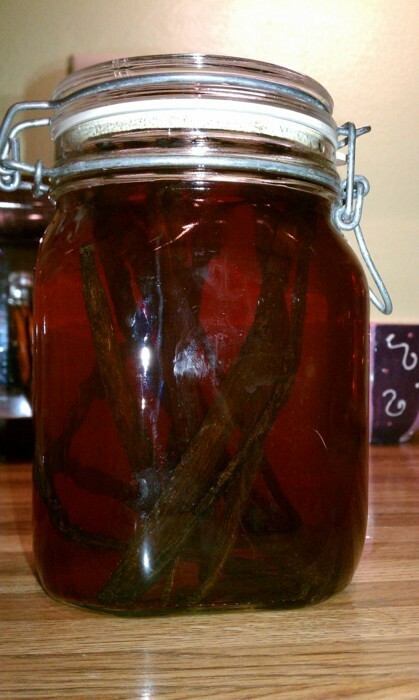 To prepare to make my own vanilla, I first purchased 1/2 lb of vanilla beans (planifolia) for super cheap at Vanilla Saffron Imports. 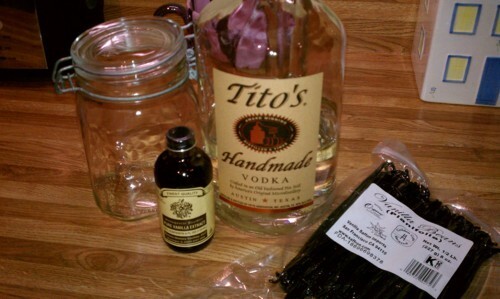 I also picked up a handle of Tito’s Vodka and a 4 oz bottle of Nielson-Massey Vanilla extract. The article recommends seeding your vanilla batch with good vanilla extract that you’ve purchased to make the process go faster. I did that, but only used half of my extract bottle and instead doubled the beans that I put in my jar. After 4 – 6 weeks I should be able to pour some vanilla out of this jar for use in my normal baking exploits. Each time you do that, you can top the jar back off with vodka. For now, I’ve stored the remainder of my vanilla beans with some sugar as the package recommends. Hopefully they’ll still be good when I need them for my next batch. I’ve not worked with vanilla beans before. I’ll let you know how this experiment turns out. ← What to do with more kale?